This is a limited edition bottling from Bunnahabhain – a Scottish distillery, located on the north-east coast of Islay. Their standard 18 year old bottling is one of my favourites for the style – which, surprisingly for Islay, is unpeated. But the coastal environment helps brings in some unique features, which combine well with Bunnahabhain signature oily, flavourful character. Bunnahabhain releases limited editions somewhat irregularly – the last was an Oloroso cask finish in 2016, I believe. This release is a 14 year old single malt, distilled in 2003. It was initially aged in second-fill Oloroso sherry casks until 2011, at which point it was transferred into first-fill Pedro Ximénez casks. It was bottled in late 2017 at cask-strength, 54.3% ABV in this case. Only 6768 bottles were produced, released in most jurisdictions in early 2018. I was lucky to come across the release of a single case at World of Whiskies in Calgary, Alberta in late March of this year – and promptly picked up two bottles for $180 CAD each, on discount ($200 list price, tax in). As you can imagine, these sold out fast! I’ve recently opened bottle #2389. 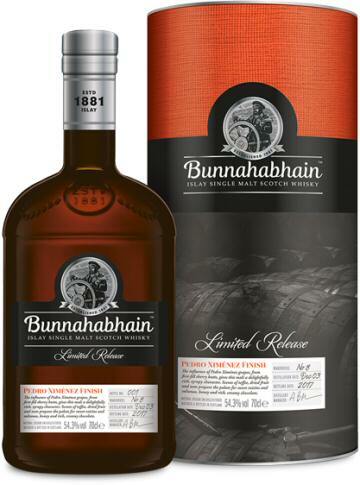 This Bunnahabhain Limited Release scores comparably to the best cask-strength offerings of competitors. Colour: Rich, dark gold with some light mahogany hues. Nose: PX sherry dominates on the nose – this is a super sweet one. Molasses, caramel. Red fruits, dark berries, raisins and red grapes. Lemon cake. Candy cane. Faint hint of anise. Nutty. Classic Bunna funk (like an extinguished campfire). Sea salt. Fabulous nose if you like them sweet. No off notes. Palate: Dark brown sugar, demerara sugar. Thick and syrupy. Caramel and red berries again. Cherry compote pie filling – complete with the buttery pastry shell as well. Chocolate shavings. Cinnamon. Oaky wood. Tobacco and coffee grinds. Goes down smooth. Slight astringency on the swallow. Finish: Medium long. Candy-like notes are the most prominent, with brown sugar and caramel that linger (very chocolate bar-like). Light cinnamon. Sticky residue on lips and gums. Lemon returns, as does the nuttiness at the end. With water, brown sugar now becomes very apparent on the nose. Fruits are enhanced in the mouth, which I appreciate – so I definitely recommend a few drops. But further water brings up the cinnamon and oaky notes (with some bitterness), and lightens the mouthfeel, so be careful here. To call this a dessert dram is an understatement – it is a heavy assault of liquefied brown sugar! Personally, I prefer it over some of the batched sherry bombs that contain a mix of Oloroso/PX cask-aged whiskies, like the recent Glendronach Cask Strength batches. Among reviewers, my stable of Reddit reviewers were generally extremely positive, giving it top scores – starting with theslicknick6, followed by MajorHop, HawkI84, Unclimbability, Strasse007 and WildOscar66. A below average score was given by throwboats (and a few others on the site). There aren’t many other reviews out there, but it gets a slightly above average score from Ruben of Whisky Notes and Gavin of Whisky Advocate. It gets an extremely low score from My Annoying Opinions (which frankly seems a bit bizarre). Clearly, this is a whisky with some variable perspectives. Personally, I’m more in-line with Strasse007 and WildOscar66 above – I think this is a very nice whisky for this class. I think the Meta-Critic average is fair, especially relative to the Bunnahabhain 18 yo. I’m glad to have a bottle (and a spare) of this limited release. 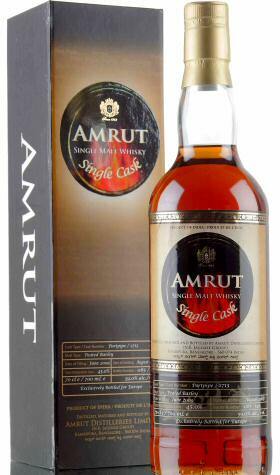 This single cask Amrut was first matured in charred American virgin oak casks, followed by further maturation in a Port Pipe cask (which are very large casks, holding 650 litres). I have a bottle from the third batch of this whisky matured in Port Pipe cask #2712, exclusively bottled for Western Canada (where I picked this up). To clarify a point of confusion – Amrut sometimes re-uses finishing casks (like these Port Pipes). The front label of my bottle indicates that the barrel was first filled in January of 2011, and the whisky was bottled in February of 2016. There’s a Batch No 3 imprint on the back label, indicating that this is the third time Port Pipe 2712 has been used. I don’t know how long this batch was finished in this Port Pipe, but there are reviews out there for an earlier August 2013 release from this same #2712 finishing cask (so, this release has to be finished for less than 2.5 years, by definition). I have one of 660 bottles of this third batch. 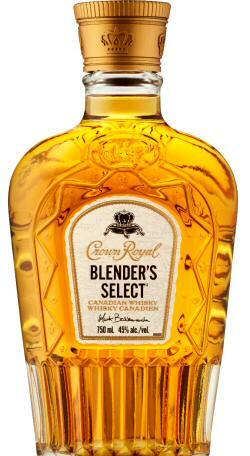 It is bottled at cask-strength of 59.0% ABV. 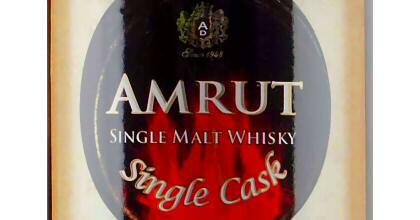 I am currently tracking four Amrut Port Pipe casks in database (#2713, 2714, 3881, and 4668). To date, it is only #2712 and 2713 where I can find multiple bottlings reported. Nose: A pleasantly peated nose, with a strong salted-meat aroma – smoked bacon and salted pork in particular. Smoked BBQ ribs. This is a very “meaty” nose, unlike the medicinal or rubbery noses of most heavily-peated Islay malts (i.e. its more like some Highland Park or Ledaig expressions, or even Springbank). Anise and dark chocolate, very earthy. Blueberries and raisins. It’s a great combination of peat and sweetness – it works. Surprisingly little alcohol burn for 59% ABV. No real off notes. Palate: Strong attack of peat and sea salt to begin, followed by classic bourbon notes – honey and brown sugar. Honey glazed ham. Not as smokey in the mouth. Anise and dark chocolate again, plus caramel. Cinnamon and black pepper. Fruits lean more toward the tropical now (mango, papaya), not really finding the port so much. Bacon notes come back at the end. Thick mouthfeel, slightly oily. Surprisingly easy to drink for 59% ABV. Finish: Long. Leaves a noticeable tingle on the lips and tongue that is oddly pleasurable – this is actually quite anesthetizing (as you would expect from the strength). Sea salt and BBQ-glazed ribs. Some dried fruit notes appear over time. Smoke lingers to the end. With a little water, the sweet fruity notes on the nose are accentuated. Mouthfeel is unaffected. Lingering sweetness is increased on the finish as well, which becomes more sticky on the lips and gums. If you keep adding water, to bring it down to more typical whisky strength, you will find the wood spices pick up a lot in the mouth (especially the cinnamon and pepper) – so it still leaves a sting. Finish becomes more astringent at this diluted level. This is one that can handle of wide range of water, with differing effects. I suggest you experiment to find your personal sweet spot. A pleasant dram, but not overly complex. I find the average Meta-Critic scores for the peated Port Pipe singe casks to be a little on the low side. I would rate this particular bottling slightly higher than what it gets above (i.e., ~8.9). A number of Reddit reviewers have sampled from this particular single cask #2712 (2016), such as xile_, Devoz, Ethanized, Saba007 and Pork_Bastard. Thomas of Whisky Saga was a big fan of another batch, as was Serge of Whisky Fun (for this batch) and Michael of Diving for Pearls. My Annoying Opions, Ralfy and Jim Murray all give their batches good scores. Jonny of Whisky Advocate and Serge of Whisky Fun (for this batch) were not impressed. Being a big fan of the other Orkney island distillery (Highland Park), I’ve been curious to try a Scapa release. Literally right down the road from HP, this second-most-Northerly distillery in Scotland produces a relatively gentle and honeyed based spirit, considered to be lightly-peated. Originally founded in 1885, it was acquired in the 1950s by classic Canadian whisky producer Hiram Walker & Sons Ltd. Now part of the Pernod Ricard spirits empire, Scapa was shuttered between 1994 and 2004. While a number of age-statement releases were released upon re-opening, for the last several years the no-age-statement Scapa Skiren has been the distillery’s standard bottling. Scapa’s website says they consider Skiren to be “the honeyed tropical one because of its smooth, creamy sweetness with a hint of tropical fruit, citrus and coastal heather.” It is exclusively matured in first-fill American oak (so, ex-bourbon barrels). Bottled at 40% ABV. It currently retails for $80 CAD at the LCBO. Let’s see how it compares to others in my Meta-Critic Whisky Database. I sampled this single malt from my brother’s bottle. Nose: Sweet peat, with light smoke. Sickly-sweet honeysuckle (honeyed indeed!). Standard pear and apple. Maybe a touch of pineapple. Very basic, not a lot going on here. I’m detecting some youthful organic notes, but the light peat helps to obscure these somewhat. Palate: Incredibly sweet arrival, with very simple sugar and light honey. Pear. Lemon peels. Buttered toast. Very light mouthfeel. Not getting a lot of wood spices, beyond standard nutmeg and a bit of cinnamon. Very little evidence of the peat now. Seems pretty tame (and dull, to be honest). Finish: Not much of one. Apple juice and some Juicy Fruit gum linger, with some very light oak spice. A touch of smoke returns at the end, but is subtle. Unfortunately some oak bitterness creeps in over time, detracting on the way out. 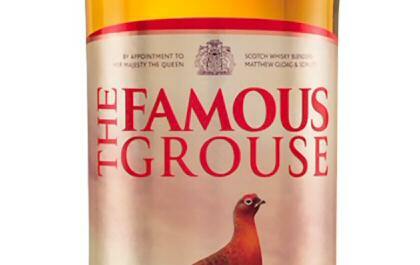 Sad to say, but I find this to be a very forgettable whisky – there is nothing that really stands out for me. There is just too little character. That said, it is not particularly offensive, and I don’t get a lot of off-notes. I suppose it could be a decent palate opener, before trying more sophisticated whiskies in an evening. Among reviewers, the highest score I’ve seen comes from Richard of the Whiskey Reviewer, followed by Jim Murray. Generally positive (though with lower scores) are Serge of Whisky Fun and Jan of Best Shot Whisky. But I’m personally in the camp of Thomas of Whisky Saga, Oliver of Dramming, Gavin of Whisky Advocate and the boys at Quebec Whisky. Just not enough character for me to recommend, especially for the price. You are best sticking with an entry-level HP. 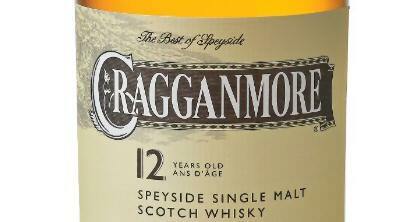 Cragganmore is part of Diageo’s Classic Malts series. This is where they select one distillery from each geographical region of Scotland (from among their stable of distilleries) to showcase the “classic” malt style of that region. Cragganmore specifically represents the Speyside region in this case – which is traditionally thought of as relatively gentle malts. As I explain on my Single Malt vs. Blends page, this historical classification based on geography simply isn’t very relevant any more (if it ever was). The traditional production methods used in different regions can (and often are) adjusted today to suit a range of modern styles. This allows each distillery to offer a wide range of diverse products, to appeal to different tastes. At any rate, at least it helps save some of the output of these distilleries from being poured (literally) into Diageo’s behemoth blending operation. Cragganmore is believed to be one of the principal malts in Johnnie Walker Black Label, as well as Old Parr. The distillery was opened by a former manager of both Macallan and Glenlivet, John Smith, in 1869. It draws water from Craggan Burn, off the River Spey. Their main claim to fame is the distinctive flat-topped design of their spirit stills (as opposed to the more common elongated necks of their competitors). This is supposed to produce a particularly “sweet and complex” base spirit, according to Diageo. This official bottling of the distillery’s 12 year old malt is reported to come exclusively from refill bourbon casks. I’ve also seen some reports online that some portion of it comes from sherried casks, but I find that hard to believe after sampling (see tasting notes below). Bottled at the industry minimum standard of 40% ABV. I picked up a 200 mL bottle for ~$25 CAD when passing through Norway last year. Currently $67 CAD for a 750 mL bottle at the LCBO. Nose: I get a strong apple juice note to start, then light honey, vanilla and some caramel. Also some canned pear. Vaguely floral, I get heather and hay most noticeably. A bit malty, with a touch of Graham cracker. Light smoke, with a bit of vegetal funk (that last one is surprising for a classic Speyside). A nice combo overall. Reminds me a bit of Oban 14 year old. Palate: Cream and honey to start, then caramel and vanilla notes. Apple and pear again. Malty, with Graham cracker notes. Not as much smoke as the nose suggested, but there is a little something here tingling the taste buds. A vague nuttiness. Some oak spice. Would be nice at higher strength, but ‎actually quite drinkable as is. Some bitterness builds at end of the palate (bitter almonds). Finish: Medium length (and longer than most gentle whiskies). Smoke residue lingers, along with some bitter almonds. Peppery too now, wasn’t getting that before. A bit of fruit returns at the end. Nice, easy finish. This is quite sippable. I’m not really getting any sherry notes here, but it is a well executed malt for the style. Personally, I would put this at least on par with An Cnoc 12. It is not at the level of Oban 14 or Dalwhinnie 15, but the touch of smoke here really helps add character (and bring up its score). In my view, Cragganmore 12 Year Old is a good one to try soon after starting out with single malts, once you have sampled the ubiquitous Glenlivet/Glenfiddich 12. Like with the Oban and Dalwhinnie, this is a whisky where I think you will appreciate the extra character it brings over the common entry-level expressions. The highest scores I’ve seen for this malt comes from Nathan the Scotch Noob and Andre of Quebec Whisky. Patrick of Quebec Whisky and Dave Broom of Whisky Advocate are also generally positive. More typical (and more in keeping with my own assessment) are Ralfy and Serge of Whisky Fun. Relatively low scores come from Jason of In Search of Elegance, Jim Murray, Richard of Whiskey Reviewer, and Thomas of Whisky Saga. 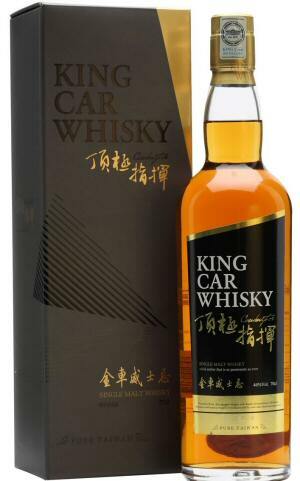 Although my first experiences with Taiwanese producer Kavalan were the entry-level Single Malt and Concertmaster editions, King Car Conductor has similarly been around for some time. 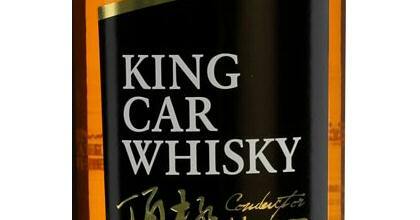 Indeed, this was the first expression launched under the King Car name (which is the parent conglomerate group that owns Kavalan). This single malt was apparently designed to showcase a wide range of flavours, consistent with the spirit of the parent company’s diverse range of interests. It is rumoured to contain a wide mix of cask types, but I don’t have any specific information on the age or composition. Bottled at a higher ABV of 46% (like Podium), it could be considered a step up from the 40% ABV Single Malt and Concertmaster offerings. And like Podium, I managed to pick up a 50 mL sample bottle on a recent trip through Tokyo. Bottling code date was 2016.04.21 07:06 on my sample. Nose: Very fruity nose, with various tropical fruits – papaya, guava, pineapple, coconut and banana. I could smell the fruit before bringing the glass to my nose! Lemon. Lots of caramel. Some vanilla. But that’s it really – not much character beyond the fruity and woody sweetness. No real off notes, except for being a bit spirity. Palate: More honeyed in the mouth, although still with caramel and vanilla. There is something that reminds me of that classic bourbon barrel char sweetness here. Fruits are less distinct, and seem watered down (e.g., add water-logged melon and cantaloupe). Lemon pledge. Getting the wood spices now, cinnamon in particular, and black pepper. A bit of ethanol heat as well, more than expected from the ABV. Also seems a bit watery in mouthfeel given the ABV, but a touch oily (which I like). Classic Kavalan astringency on the swallow. Finish: Medium. The fruit returns on the finish, but more dried now. A touch nutty. Soft wood spice rounding it out, this is actually a nice fade out (if a bit simple). It is actually less astringent than most entry-level Kavalans. Certainly a step up from the base Kavalan Single Malt expression – this one has more fruit on the nose (and less astringency on the finish). I strongly recommend trying it with a few drops of water, to help tame the heat on the palate. Overall, an easy sipper with a fair bit of fruity character – but not too challenging. I still find it to be a fairly basic expression, lacking the vibrant character of their various “finished” offerings (especially the Solist series). But still happy to finish a glass. Among reviewers, the most positive review I’ve seen is Dominic of Whisky Advocate, followed by Jim Murray and Oliver of Dramming – and most of the Reddit reviewers. I’m very much in the same camp. Less positive are Serge of Whisky Fun, My Annoying Opinions, and Ralfy. 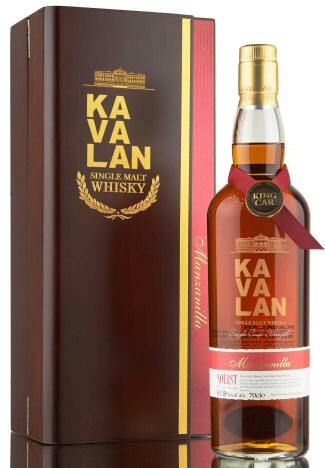 The Kavalan Manzanilla sherry single cask is one of the limited Solist releases, like the Amontillado and Moscatel single cask expressions. Unlike the more common Solist ex-Bourbon and Sherry single casks from this Taiwanese producer, these specialty limited-release versions come at a high retail cost (typically >$500 USD, if you can find them). Manzanilla is a type of fino sherry – a pale, dry sherry from the Andalusia region of Spain. “Manzanilla” apparently means chamomile in Spanish, and the flavour of this wine is said to be reminiscent of chamomile tea. 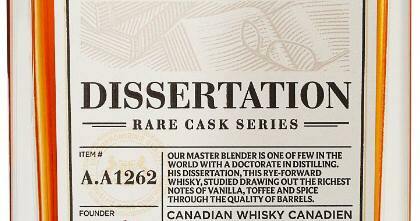 Bottled at cask-strength, 57.8% ABV in this case. Being a big fan of the ex-Bourbon and Sherry Solists, I’ve been curious to experience the influence of these more rarefied specialty sherry casks. My sample came from theslicknick6 of Reddit. Nose: Brown sugar. Drier sherry notes, consistent with fino sherry. Grape juice. Lemon. Very earthy, with moist and dry notes. Over-roasted coffee beans. Fisherman’s friend throat lozenges. Dry cardboard. A pronounced sourness, which is a bit off putting. Surprising amount of organic off notes, definitely seems young. With water, the sweetness is raised – which helps compensate against the sourness. Palate: Very sweet arrival, with brown sugar and caramel. Also creamed sugar. Raisins, sultanas, cherries and dark red grapes. Cocoa powder. Nuts. Leather. Vanilla. Cinnamon. Very thick mouthfeel – syrupy – like other solists. As usual, very nice in the mouth. Can actually drink this neat, which is impressive for a sherry bomb. With water, even sweeter (as expected), and mouthfeel becomes more oily. Finish: Long, with slowly fading raisin and brown sugar notes. The winey aspects of the sherry build up with time, which are nice. Good mix of sweet and sour. Cocoa persists to the end. It is only the disjointed nose that holds me back from giving this a top score. On the palate and finish, this comes across as a more refined version of the classic Solist Sherry expression. A little water helps, but it honestly doesn’t need much. A very pleasant sipper. Personally, I would score this at the low end of the range of reviews out there, as I prefer most other Solist expressions I’ve tried. theslicknick6 gave this particular bottle the highest score I’ve seen from him yet. Strasse007 was also very positive of this bottling. 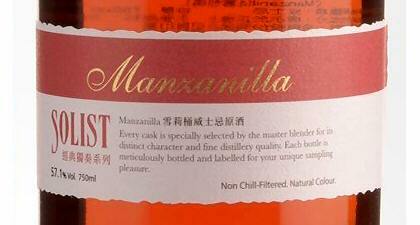 For other bottles of Solist Manzanilla, Serge of Whisky Fun and Jim Murray are similarly very positive, followed by Josh the Whiskey Jug and Jonny of Whisky Advocate. I’d definitely come in at the lower end of reviews here, but it is still a good pour to be sure.